If you're one of the many Unix developers drawn to Mac OS X for its BSD core, you'll find yourself in surprisingly unfamiliar territory. 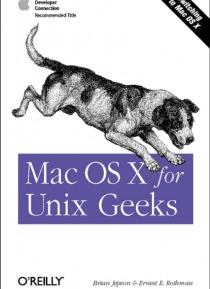 Even if you're an experienced Mac user, Mac OS X is unlike earlier Macs, and it's radically different from the Unix you've used before, too.Enter "e;Mac OS X for Unix Geeks"e; by Brian Jepson and Ernest E. Rothman, two Unix geeks who found themselves in … the same place you are. Their new book is your guide to figuring out the BSD Unix system and Mac-specific components that are making your life difficult and to help ease you into the Unix inside Mac OS X. This concise book includes such topics as:A quick overview of the Terminal applicationUnderstanding Open Directory (LDAP) and NetInfoIssues related to using the GNU C Compiler 9GCCLibrary linking and porting Unix softwareAn overview of Mac OS X?s filesystem and startup processesCreating and installing packages using FinkBuilding the Darwin kernelRunning X Windows on top of Mac OS XThe book wraps up with a quick manpage-style reference to the "e;Missing Manual Pages"e;--commands that come with Mac OS X although there are no manpages.If you find yourself disoriented by the new Mac environment, Mac OS X for Unix Geeks can help you acclimate yourself quickly to the familiar, yet foreign, Unix landscape.